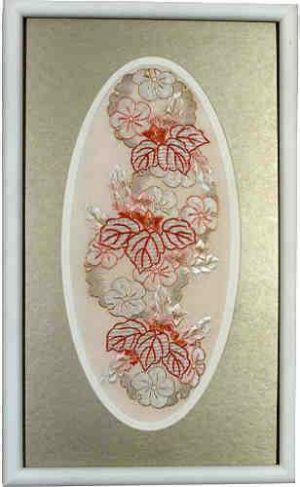 The design on this incredible Fukusa, or formal gift cover, has been created through the addition of a multitude of pure gold, hand made threads. This tedious process begins with painting very fine rice paper with liquid gold, and then wrapping a miniscule amount of this gold paper around a strand of silk thread. 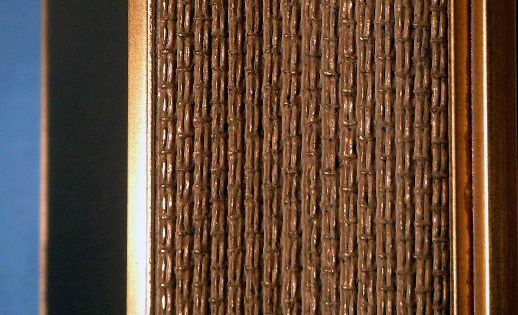 Because it is so fragile, the gold thread is then hand couched to the fabric rather than attempt to pull it through the fabric and destroy it. 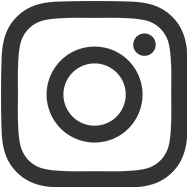 The hand woven satin silk background weave has also been hand dyed with natural indigo and other dyes that give it a softer, lighter appearance. 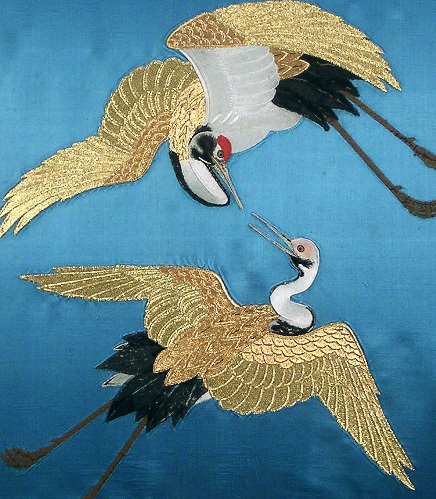 In addition to the incredible amount of pure gold threads incorporated into the design of this Fukusa, the second element that makes this Fukusa so valuable, and is so rarely found, are the glass eyes of the flying Crane. 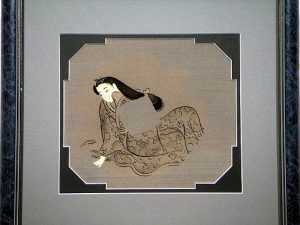 Glass eyes are associated with the Edo Era. Because this is such an extravagant piece of antique Japanese art, the image of the large flying crane was especially significant to the family who commissioned this cover from a Master Artist. This is a powerful portrayal of the Manchurian Crane (“Tsuru”) on their voyage to the legendary island of Horaisan, the Island of Everlasting Life. 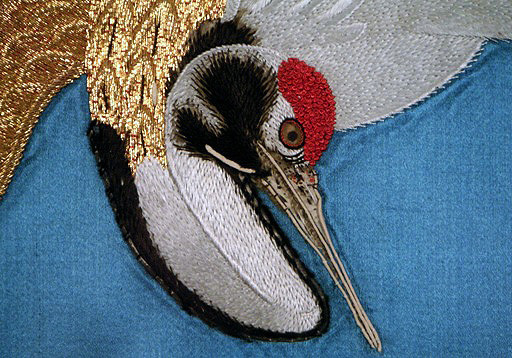 As they make their way back to the Island, these magnificent Crane must first cross the turbulent waters of Passion and Greed (the unusual blue of the Silk). This is a metaphor for a young, newly married couple who, while facing struggles in their married life, should be encouraged to follow the lead of the Crane who overcome these difficulties to achieve connubial bliss and mate for life Crane are also often associated with good fortune and with longevity. Legend has it that it takes the Crane 1000 years to fly to the Sun. Formal Fukusa used for ceremonial occasions whose hand made Silk Tassels are tied in such a way as to indicate the date of the Fukusa as well as the status of the the owner. (All 4 tassels have miraculously survived and will be shipped with the art work). 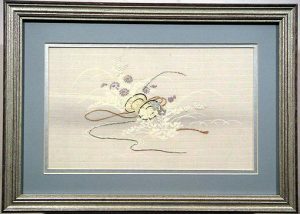 Finest hand woven Satin Silk with incredible pure gold and silk thread embroidery in excellent condition. 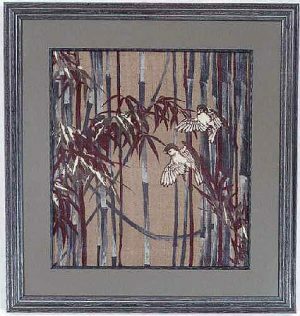 This stunning example of Japan’s enduring artwork is surrounded by a French Silk gold wood fillet, and an interior charcoal gray mat that is acid free. 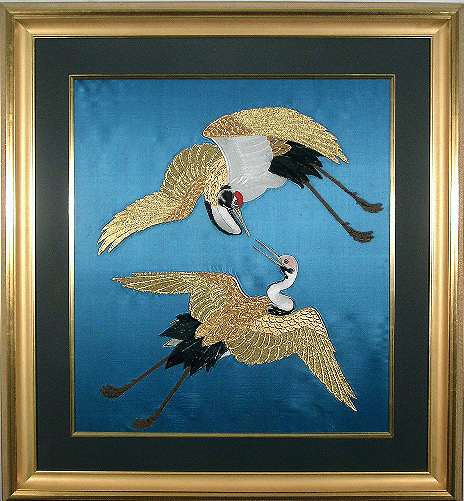 The double wood frame reflects both the varied colors of the gold threads on the Mandarin Crane and the texture of the feathers of the wings on the outer edge. It is protected by 98% UV protected Museum Glass. 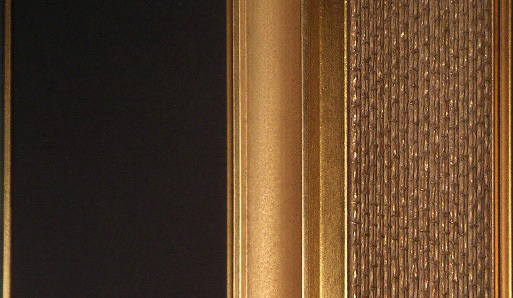 This elegant, antique Fukusa has been mounted in conformance with the highest standards in order to ensure a damage-free environment for its future protection.